Sam practicing his Mandarin language skills and musical chops during a performance at the local National Day celebration. Sam Christensen, National Security Language Initiative for Youth (NSLI-Y) participant studying Mandarin in Changzhou, China is November’s American Abroad Student of the Month. Originally from Greenville, North Carolina, Sam enthusiastically jumped into the world of intercultural differences and demonstrated NSLI-Y program values by going beyond language learning to build bridges of understanding and friendship with his local community. Early on in his exchange experience, Sam volunteered to help teach English at the primary school where his host mother is a teacher. Before long, he recruited the other NSLI-Y students to volunteer at the school as well. Sam has also been known to bring a borrowed guitar to class to liven up the English lessons and put on smile on his students’ faces. 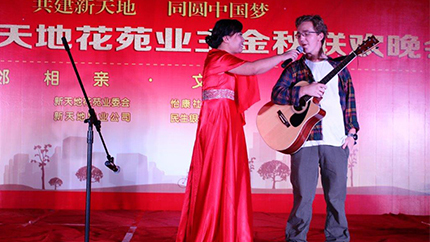 Sam was also invited to use his improving Chinese skills and musical ability during a performance at the local National Day celebration. With his classmates, other Chinese friends, and even people on the bus, Sam enjoys discussing differences in cultures, economies, and value systems. Sam’s effort to become fully immersed in China has broadened his view of the world, enhanced his language learning, and touched the lives of many Chinese friends and acquaintances.